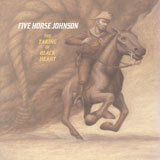 Since their inception back in 1995 Ohio based blues rockers Five Horse Johnson have earned a reputation for crafting their own brand of top quality hard stoner rock that has seen them tour with the likes of kindred spirits Clutch and Dub Trio. Their last album 2006’s ‘The Mystery Spot’ saw them collaborate with a number of special guests, the most notable being drummer Jean-Paul Gastor from Clutch. Back again after an extended hiatus, the band warmed up for the recording of this release by cutting their teeth live in 2011 before involving Gastor once again to provide the heartbeat for their groove heavy take on this timeless music genre. As with previous releases, this is not strictly straight forward, the multitude of influences make this a diverse journey that contains moments of swing, boogie and gritty hard rock. The band sound fantastic, re-energised by the break, ‘The Job’ shows in one track why they are so good with it’s laid back rhythms and southern rock n roll style, the funky swing accented by guitar flourishes and the ever reliable JP allowing Eric Oblander to tell blue collar tales in his whiskey drenched voice. This is a theme that continues throughout ‘The Taking Of Blackheart’ – At the core of the music, the band have instilled an ethos that runs through all eleven tracks that make you want to kick back, crack a beer, tap your toe and nod your head. Five Horse Johnson want to create music that is so catchy it defies you to sit still, even on more subdued tracks like ‘Hangin Tree’ which showcases a darker, sombre edge to the band, you are still carried along by the accessibility of the music. Over the course of the album the full cast of members, completed by Brad Coffin on guitar and vocals, Steve Smith on bass and Phil Durr on guitar, all play out of their skins and drag in additional help on vocals, organ and percussion to round out the sound, making it incredibly diverse and busy, with harmonica parts breaking through the rock solid foundations and clicking drumsticks adding extra dimensions. ‘The Taking Of Blackheart’’ may owe its roots to the originator of Mississippi Delta Blues, but its outlook is as fresh and modern as anything else released this year. At times it would be quite easy to compare them to Clutch, but whilst you can draw similarities to their Strange Cousins (not least the drumming style) FHJ have more in common with the same barrelhouse rhythms, fuzzy guitar and southern boogie that served ZZ Top so well with it’s heads down driving riffs embellished by clever lead guitar. As with all blues music, it is the space the musicians create for each other to express themselves and this skill of knowing when to ease off and play it loose is best evidenced on ‘Smash & Grab’ which is more like a well crafted, yet spontaneous jam. Last time out ‘The Mystery Spot’ was widely regarded as FHJ’s strongest album with the additional musicians pushing the band harder and further than they had done before and this album sees the band step up another gear again. Always at home in the live arena The ‘Taking Of Blackheart’ gives the listener eleven more tracks that would be ideal for a dingily lit drinking house with sawdust on the floor and the smell of cheap bourbon in the air. As gritty and as heavy as before, the band have taken time out and come back as strong and determined as ever with literally every contributor helping to raise the bar and show the world what they have been missing. Whilst the incestual relations with Clutch have been good for both bands, it is great to hear FHJ back and underlining their own existence. Let’s hope they don’t leave it so long next time.